Jones & Maher Limited is a family-run business. Established by Martin Jones in 1983, the business has gone from strength to strength – underpinned by the philosophy of providing a quality service that returns excellent value for money. 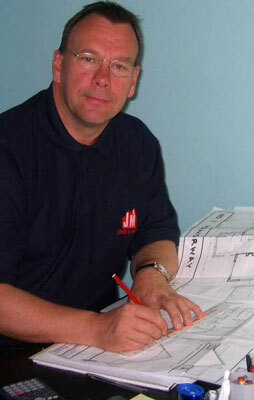 Martin has a wealth of invaluable experience in the construction and housing development industry. With a background in engineering, he has created a bespoke building company that has its focus firmly on customer care. His passion is the challenge of a new project. His commitment to his clients and the successful completion of their individual project, has driven the company forwards to the extent that the exceptional quality of our work has become our trademark. Integral to our drive for quality, is our team of skilled craftsmen. Many of our staff have been with us almost since day one and others started with us as apprentices who we supported through college and watched them become proficient in their chosen trade. We have a very proactive approach to staff training and development – and consequently have forged close links with Coleg Sir Gar – the local construction college – to keep our staff up to date and informed of the latest technologies and safe working practices to assist them with their work. We also participate in the college’s apprenticeship scheme run in conjunction with Construction Skills. The stability and experience of our workforce means we have a team of trusted craftsmen at your disposal to undertake your building requirements competently and professionally. To further underline our commitment to giving excellent customer service, we have been members of the NHBC since 1986, giving the additional reassurance of a 10 year warranty on our newbuild developments, and also have National Federation of Builders approval (achieved after their rigorous vetting process).